The Bullmastiff is a very sweet and subdued breed when undisturbed. As a companion, it is very devoted to its owners as well as to its family. Once it feels threatened by a stranger or intruder, it becomes very stubborn and will act solely upon its will, without being able to be bribed out of that decision. Many Bullmastiffs can act aggressively towards strange dogs that it does not recognize. It tends to be very good with children, however, should always be supervised when playing with children. In order for this breed to stay healthy, it needs to be exercised on a daily basis. Its workout needs can be met with a short run, a long walk, or by playing active games with the dog. It is great as a family pet, as it has tons of energy to expend. However, if it is too hot and humid outside, it prefers to stay indoors. If this is the case, indoor activities should be created to ensure that it gets the appropriate exercise. Also, keep in mind that this breed drools more than most so it will need to be cleaned up after at times. Its fur coat is shorter and requires little maintenance. It should be brushed at least once a week though, to ensure that dead skin and excessive hair is removed. As for health concerns, gastric torsion and CHD, also known as Chronic Hip Dysplasia, are often evident as minor health concerns. If you notice signs in your dog that it may have symptoms of either of these conditions, your dog should be taken to the vet immediately. If caught early enough, both are treatable, but not necessarily curable. It is suggested to get your Bullmastiff tested for hip, eye, and elbow issues every year to ensure good health in your dog. The Mastiff is one of the oldest breeds in the country of Britain, however, the Bullmastiff is actually a more recently evolved breed. 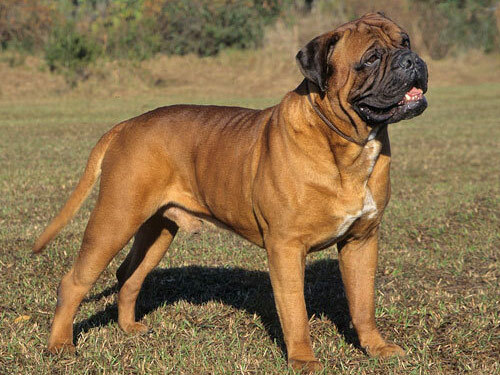 Crossing of the bulldog and the mastiff can be dated as far back as to the late 1 700s, however, there is no linking evidence pointing to the fact that these attempts successfully produced a breed that reproduced throughout time. The actual documentation of the Bullmastiff begins closer towards the end of the 19th century. The owners of large estates lives were in danger because of poaching and they began to search for a dog breed that could silently wait for the poacher, attack them on command, but not kill the poacher. The older Mastiff was not quick enough to execute this need, and the bulldog was not large enough to get it done either. This is when they decided to cross the breeds in order to create the Bullmastiff that was to be used for this very purpose. The coined a nickname for the breed as the “Gamekeeper’s Night Dog.” The color that was preferred was dark brindle so it could fade into the night. Eventually, this breed made its way to America and became very popular. It was inducted into the AKC in 1933.